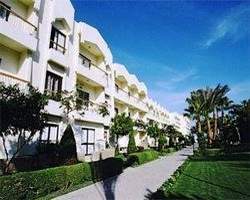 Located in Hurghada, one of the most popular spots on the Red Sea. The Helnan Regina Hotel is ideally situated in the center of town but yet on the sea. With its clear, calm blue waters and endless variety of marine life, Hurghada is ideal for water sports. The relatively shallow and lucid waters offer an excellent opportunity to experience the marvels of the Red Sea. Hurghada is also a renowned fishing ground for those interested in deep sea fishing. The Helnan Regina Hotel allows guests to explore the Red Sea by land or water. Helnan Regina Resort facilities cater to those who want to dive, fish or snorkel and to those whose ideal vacation is a good book by the pool. 299 guest rooms & chalets.All rooms are within reach of the deep blue water of the Red Sea and the sandy beach. Air conditioning, Satellite television, Private bathroom & shower and Telephone.